What is now a classic racer, the class is famous for winning 24 Olympic medals in its heyday. This one was built in approximately 1972 and subject to extensive renovation in 2013/14 when she was modified for single handed sailing, resulting in an extremely fast day sailer. The renovation included new running rigging, spinnaker and associated gear plus two good main sails and jibs. Re coated with International Toplac paint. 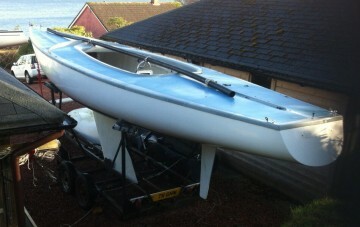 The boat comes complete with a serviceable 4 wheel trailer with very good tyres and bearings.